There has been a great deal of activity here at the Inn over the past two months. 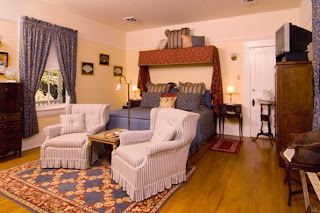 This time of year is always exciting because Mike & I spend much of our days updating rooms here at the Inn so that everything feels fresh and new for our guests. 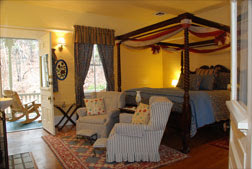 This year we focused on updating two of the Inn's guest rooms. The first was Joe's Fishing Place. 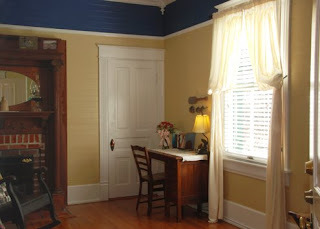 We've always loved the fishing theme but wanted to update the room with a fresh coat of paint, new colors, linens, etc. Here are the pics! 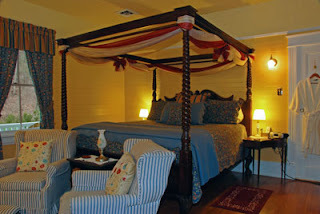 The second room to receive a makeover was the Pride of VA. Our new hand carved canopy bed was an exciting find for this room update. 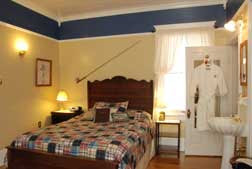 As a part of our additions and for our guests' comfort, we added coffee pots and Ipod/CD/Alarm Clocks to every room. All rooms now have wooden blinds that are much easier to work. Also, our assistant innkeeper, Carl, handmade beautiful wooden lap desks for every room. What a difference a few weeks of work made. So come for a visit. Experience our updates for yourself.